The length of the hooded vulture is 67 to 70 centimeters with a wingspan of 176 centimeters. 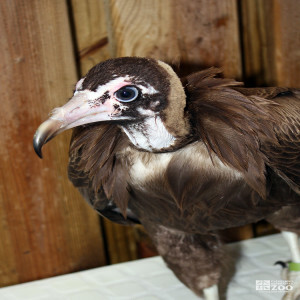 The hooded vulture is a small vulture with long thin bill and pink face that can flush to bright purple. Sexes look alike. The range of the hooded vulture is Mauritania east to Ethiopia and south to Namibia and South Africa, except areas of uninterrupted forest or desert. Hooded vultures inhabit mainly open woodland and savanna. Incubation: 48-54 days. Fledging is 89 to 130 days. Clutch size: Single egg with reddish spots on whitish base. Young chick is helpless. Hooded vultures are gregarious at larger carcasses, but can’t compete with larger species, so takes scraps and with fine bill can pick meat from between bones. Male will provide food for chicks and mother for 21 days, then both do feeding. Hooded vultures lay their eggs usually after rainy season: Oct. – March in West and Northeast Africa. January and April-July in East Africa. May to August in South Africa. Breeds year around. Crops and gizzards can be distended to hold several days’ food. Carrion and some small insects.